"If you're looking for a heart-rending story about geese, read this book!" My name is Lisa Amato and I live in Wilmington, North Carolina. 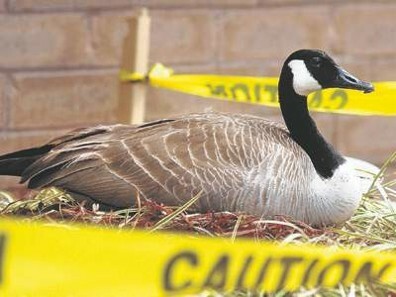 This year, we had geese nest beside our store, J C Penneys. We all took care of them till she hatched her five eggs. We named the male James Cash and the female Penny. They made The Star News twice (we have The Star news report below). We all fell in love with them. And we continue to care for them and visit them often. 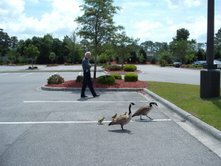 Our store manager Tom Saffarn walked them to a pond down from our store to make sure they got there safely. A mother goose sits on her nest in a planter at the J.C. Penney store at Wilmington's Independence Mall. Published: Wednesday, April 1, 2009 at 12:20 p.m.
To most people, Independence Mall is where you go to get clothing and other must-haves for the family. 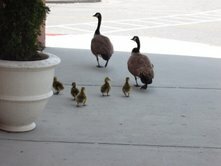 But to a pair of Canada geese, the Port City shopping mecca is the perfect place to start a family. The duo decided to nest in a 2-foot-tall planter box next to J.C. Penney on the west side of the mall. "Our workers started seeing them hanging around about two weeks ago," store sales manager Melissa Jones said. "Then they started building a nest, which caught us all by surprise." The first egg was laid on Sunday, with more expected. Folks are hoping to have fluffy yellow goslings walking around in about a month. "Our employees are having a ball with them," Jones said. "We've adopted them as our mascots." Andy Wood, education director for Audubon North Carolina, said it's not unusual to see nonmigratory Canada geese nesting in perplexing places. "These geese are acclimated to people, very much like the pigeons you see in the city," he said. "They're comfortable in an urban setting." Wood said the mother goose probably chose the planter because it's elevated and provides protection from predators and flooding. "And the geese will be fine," he added. "They chose that place knowing where they can get food and water from." Jones said that's likely a retention pond at the southern end of the mall's parking lot. Still, the store's employees have put out food and water bowls for the expecting parents. And yellow "caution" tape rings the planter to make people aware of the geese's presence and keep spectators a safe distance away. "This isn't a dog or a pet cat," Wood said. "This is a wild animal and should be treated as such." Jones said word about the geese is slowly getting around the store, although customers are still coming in a little perplexed by what they're seeing outside, with some wondering if the geese are fakes. "We're just having a good time and watching and waiting and hopefully will have something to celebrate in a few weeks," she said.